1. Identify the true cause of the problem. Remember that ‘symptoms’ of problems and ’causes’ of problems are often totally different things. A misdiagnosed problem (just like a misdiagnosed medical problem) can make things worse than doing nothing at all. 2. Find proven solutions to overcome this problem. Yes, this seems like an obvious point, but often teachers ‘guess’ or use the trial and error approach to teaching guitar. Surround yourself with other experienced guitar teachers. Ask them for their advice on your specific challenge, doing so may save you and your student a lot of time and frustration. 3. Communicate the causes and your solution to your student’s problem. Again, this may seem like common sense, but fact is, most teachers do not fully explain the cause and solutions to the problems students have, they sort of skip this part and move directly into implementing the solution. The reason why communicating the cause and solution to your student is so important is that, without the student truly knowing what these things are, they often won’t truly practice your solution diligently at home. 4. Implement the solution (training). To be the most effective, you need to do more than ‘teach what to do’, you need to ‘train’ them to do it. The ‘teaching part’ can usually be done quickly, but it is the ‘training’ that takes the time. Think more like a sports trainer and less like a school teacher as you implement solutions while teaching guitar (more on this below). 5. Hold their hand – You do not need to treat all your students like children (unless they are children), but when teaching guitar, it is important that you monitor your students’ motivation level and help them to keep it high. 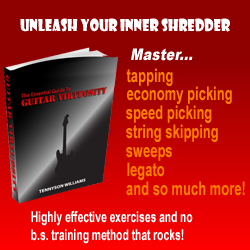 A mediocre guitar teacher who keeps his/her students highly motivated will almost always get much bigger results than a great ‘technical’ teacher who does little or nothing to keep students inspired and motivated – yet this is an area most teachers don’t do consistently well in – because they underestimate its importance. © Tom Hess Music Corporation.